No drill hole cleaning is required when using hollow drills. This saves time. Fixing in hammer-drilled or diamond-drilled drill holes. Installation in water-filled drill holes. Approval for cracked concrete and seismic loads. Approval for post-production rebar connections. 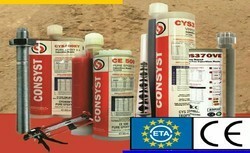 Application: The versatile injection mortar for anchorings in cracked concrete and masonry. - Styrene-free, quick-curing high-performance hybrid mortar (contains vinyl ester resin and cement). - Resin and cement as well as water and hardener are stored in two separate chambers and are not mixed and activated until pushed through the static mixer. - Post-installed reinforcement bars in concrete. - Can be used close to the edge and with a small spacing. 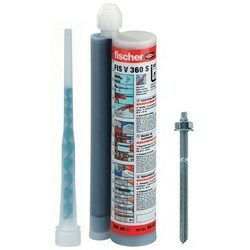 We are highly acknowledged organization engaged in presenting a remarkable range of Fischer Injection Mortar. Fischer is involved in offering a top quality gamut of Injection Mortar (FIS V). Provided mortar is formulated from the top quality chemicals and latest technology at our vendors end. This mortar is mostly used for large truss fixing, fixing of heavy loaded girder supports, fixtures in old concrete, cable trays etc. Features: Fischer Chemical Injection Mortars FIS V 360The FIS V is a 2-component injection mortar based on vinyl ester hybrid.Resin and hardener are stored in two separate chambers and are not mixed and activated until extrusion through the static mixer.The injection cartridges are quick and easy to use with the fischer dispensers.Related accessories for the various applications can be found on pages (non-cracked concrete),(masonry),(aerated concrete) and (rebar connection). We are well known supplier of Injection Mortar from Pune.